Rocks stacked up at Halibut Point State Park. I'm sure there's some meaning behind stacking rocks. I think they are supposed to represent visiting a place and leaving the place undisturbed or acknowledging a loss. I'm never quite sure. 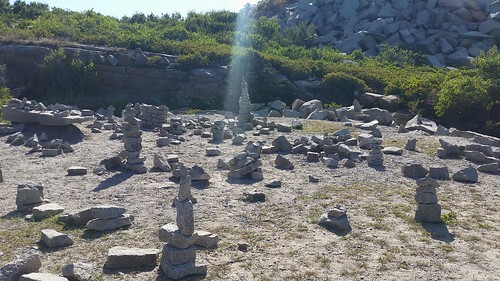 However, here at Halibut Point State Park, I am guessing that it's merely become a fun activity given the propensity of decent size rocks in the area to stack. I found the different stacks curious and wondered why each creator chose that stack to make their mark. I was also pleased that the sun ray come in, appearly to shine on the tallest of the stacks available.